What a fun show. Not in the sense of silly or lacking seriousness, but in the sense of playful, imaginative, high-energy, and entertaining. And flat-out amazing. What begins with three slow piano chords bursts into nearly 90 minutes of nonstop music-making fun. For a time she sported a two-tone ponytail. When she walks on stage, her bouncy demeanor, megawatt smile, and little-girl voice can fool you into thinking she’s a Japanese teenager on her way to the Hello Kitty store. Then she starts to play and the thuds you hear are jaws hitting tables. Her hair is shorter now, and curly (except for her bangs), and tonight she wears a black fabric flower tucked into one side, and a patterned silk shift. She’s the most animated performer I have ever seen. She turns from the piano to an electronic keyboard at her right, two more on top of the piano; sometimes she plays two at once. She can't sit still. Apparently she draws from everything she has ever heard or dreamed—classical, jazz, jingles, rock, blues, metal, video games—and sometimes her music is a bit too fusiony for me. Except for the drums and the acoustic piano, all of the instruments are wired: Grey plays electric bass, Fiuczynski electric guitar. Sounds are amplified and manipulated and sometimes you can’t tell who’s playing what, especially when one of Hiromi’s keyboards wails like a guitar. But I quibble. We hear her originals “Time Travel” and “Deep Into the Night,” both from Time Control (2007), the latter a blend of intensity and lyricism. 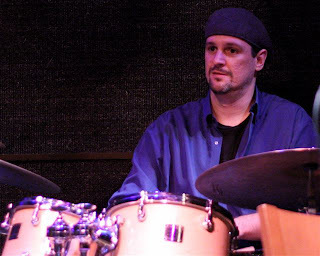 Hiromi makes room—a lot of room—for Fiuczynski, who wields his two-necked axe like Rambo’s machine gun. It's quite a guitar. Twelve strings on the top, seven on the bottom. 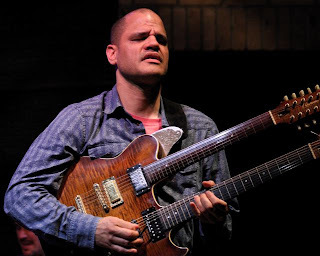 Guitar companies like Campbell America, First Act, and Sweden’s Johan Gustavsson custom-make instruments for Fiuczynski and name them FuZix, Fuzilla, Fuzeblaster. Tonight he’s playing the Fuzeblaster. I picture him on stage with Steve Smith. That would be something to see. Fiuczynski, Grey, and Zottarelli exit through the curtain, leaving Hiromi alone on stage. Her solo during the first set, as reported later by Andrea Swensson for City Pages, was “I’ve Got Rhythm,” which “then transitioned into a sprawling, banging collage of blues scales and melodies, including Gershwin’s ‘Rhapsody in Blue.’” We get Pachelbel’s greatest hit, the Canon in D, that overplayed classical cliché, only Hiromi turns it into a manic romp, her fingers so fast that the keyboard of the Dakota’s Yamaha is in danger of melting. She is a seriously speedy player. Take a look at this. Note the blurs. 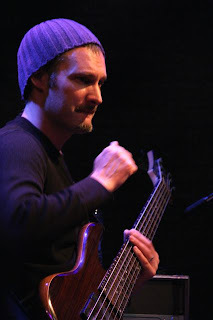 The band returns and Fiuczynski launches into some heavy riffs (his other bands include the Screaming Headless Torsos and Lunar Crush, with John Medeski) that morph into Duke Ellington’s “Caravan,” another track from Beyond Standard. 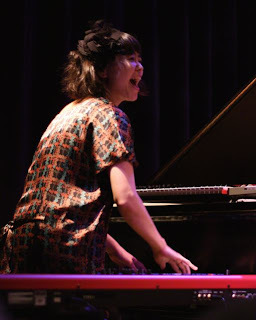 Hiromi plays the piano with her hands and elbows and forearms, bashing out blocks of notes. Here’s where one of the electronic keyboards on top of the piano sounds like a guitar. Zottarelli, who’s been working hard at the back of the stage all night, finally gets a solo, a good one. Hiromi dances and claps at the side of the stage. A fiery encore—don’t know what it is—and they’re done. I bring home a copy of Beyond Standard signed by all four members of this global band: Hiromi, born in Japan, educated there and at Berklee in Boston; Fiuczynski, from New Jersey via Germany (with stops at Jupiter and Saturn); Grey, from Newcastle, England; Zottarelli, from Brazil. Listening now to Debussy’s “Clair de Lune.” Electric moonlight.